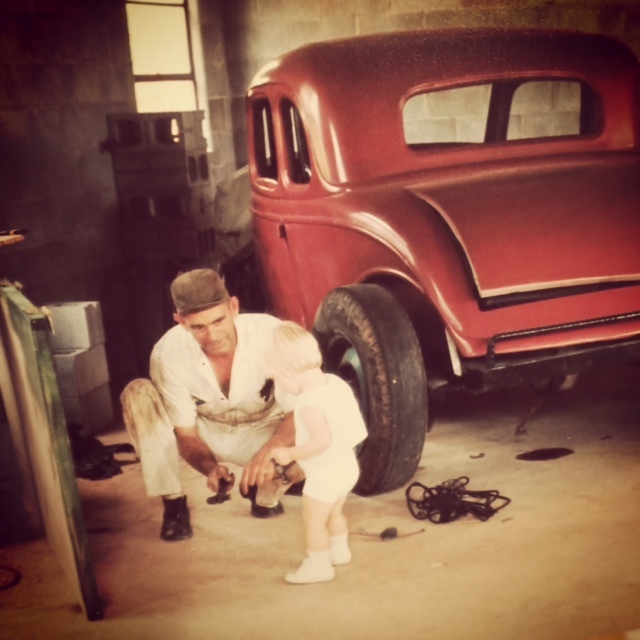 Baby me and my granddad with the car featured in Whiskey Sunrise. I’m wrapping up the manuscript for my fourth novel with Bold Strokes Books, Whiskey Sunrise, and I realized last night that I needed to flesh out a few parts of the story. One part in particular is the relationship between the main character and her grandfather. 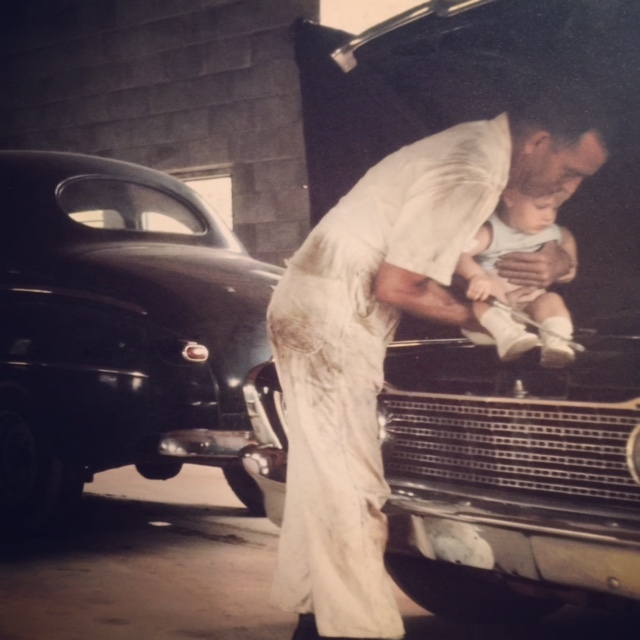 Over dinner my wife reminded me of a photo she’d seen of me and my grandfather working on cars together. She encouraged me to use my own experience to flesh out this particular scene in the book. It seems silly now that I didn’t think of my own experiences with my grandfather as source material. I mean, I’m sure on some level, unconsciously, that’s absolutely where parts of this story came from. But I’d completely forgotten about this one photo of mine in particular where the car featured in Whiskey Sunrise actually makes an appearance in the background. My granddad was an early participant in dirt-track, stock car races in rural Georgia and he always had some hot-rod-in-progress in his garage. One of the unique aspects of Whiskey Sunrise is that the grandfather in the story allows the main character to be who she is. He doesn’t try to force her into some preordained female role, he allows her to love cars and drive fast. He expects her to be able to do anything a boy her age could do. My wife and I wondered whether that sort of child rearing approach was plausible. Whether a grandfather, who grew up in a different era, could raise a granddaughter in this way. That’s when I was reminded of these photos and had to dig them out. I’m even more inspired now to add these details to Whiskey Sunrise. You never think of your own life as remarkable because you’re in it. You’re too close to it. But thinking back, here was this man who came to adulthood during the Depression, was raised in the very conservative Deep South, who had allowed me to be myself. That’s pretty remarkable. And out of respect for those of you who may not be as into cars as I am, I’ll try and keep the “car talk” to a minimum in Whiskey Sunrise. As is the case with most stories I’m interested in, this one is really all about the characters. Great blog, Missouri. And those pics are truly priceless. 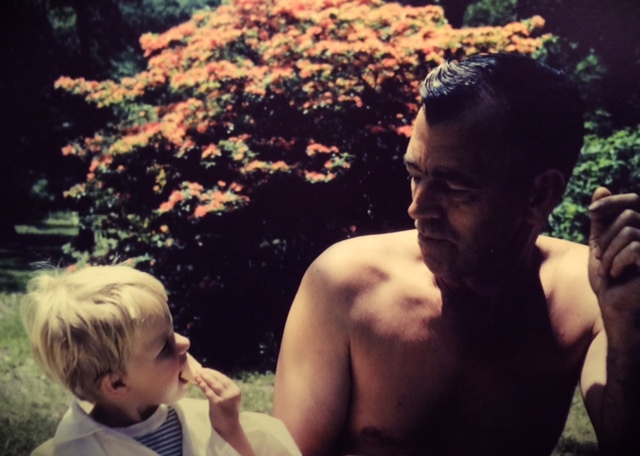 You’re so lucky to have had that time, that relationship with your grandfather. He sounds like a very special guy. Looking forward to Whiskey Sunrise!